Pulse by Norkon Computing is a real-time financial news platform with data visualization and streaming capabilities that cater specifically to financial news publishers, providing them with a solution that turns financial data into detailed and comprehensible visualizations and market analysis in real-time. With Pulse, newspapers can easily enrich their journalistic content with the most recent market data. The software adds more value to financial news, empowering subscribers to make smart decisions as Pulse further increases their knowledge of the market. Pulse comes with tools for exploring, evaluating, and tracking markets, giving publishers and editors a solution that allows them to not only provide data-rich financial news but also effectively monetize their content and grow their subscriber base. Pulse by Norkon Computing gives you a comprehensive data visualization and a streaming tool that helps financial market news providers and publishers deliver engaging and rich financial news content to their subscribers. With Pulse, you are able to tie up your news with real-time market data, giving your readers high-value content that they need for their work or business. The software is built with monetization in mind. 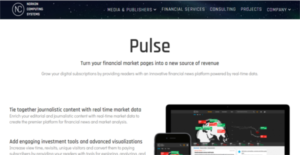 Pulse adds value to the financial news you publish, attracting visitors with high-quality content complemented with visualizations of financial markets that just wow. Pulse’s advanced visualization coupled with investment tools for exploring, analyzing and monitoring markets help reel in new visitors, increase the volume of your unique visitors, and empower them to become paying subscribers. Pulse is not only for new market pages. The software is designed to complement old market pages that you might have. Users who have used Pulse to complement their existing market pages have seen their traffic grow by double digits. You can offer your Pulse market pages as a separate service to your subscribers or bundle it with your premium subscription. Either way, Pulse helps you add more streams of revenue for your business. With Pulse, cross-selling to your current subscriber base is a breeze. While most subscribers say “No” automatically to any cross-selling attempts, Pulse helps you further by letting you offer more than just your digital products. What Problems Will Pulse Solve? Social media platforms such as Facebook, Instagram, and Linkedin and digitalization, in general, have had a deep impact on the media and publishing industry with falling revenue as a result. As a response, subscription models are being adopted across the industry. Pulse is the only financial news portal on the market built with this new revenue model in mind and has a proven track record of generating subscription revenue. Customers have monthly seen subscription growth rates above 13%, a low churn of less than 6%, longer average view sessions, and 2.5x more revisits than their old market pages. Newspapers have traditionally viewed their digital offering as a supplement to their print subscriptions and as a result, many publishers websites and their Market pages are outdated. Pulse is built to be ultra-rapid with low latency and short loading times, in addition to its modern design and features. Newspapers excel at identifying news, interpreting its meaning and relevance, and distributing it to audiences in a clear and powerful way. However, they have historically lost out to online brokerages, banks, and other financial companies when it comes to presenting and visualizing market data, analyzing the market, and tracking activity. Pulse allows newspapers to seamlessly merge their journalists’ coverage of the markets with stock prices, visualizations, and tools for analyzing, tracking, and exploring the data behind markets. If you are interested in Pulse it may also be sensible to analyze other subcategories of Best Content Management Software collected in our database of SaaS software reviews. Organizations have diverse wants and requirements and no software application can be just right in such a condition. It is useless to try to find a perfect off-the-shelf software system that meets all your business wants. The intelligent thing to do would be to customize the application for your specific wants, staff member skill levels, budget, and other aspects. For these reasons, do not rush and pay for well-publicized leading systems. Though these may be widely used, they may not be the best fit for your unique requirements. Do your homework, look into each short-listed system in detail, read a few Pulse reviews, contact the vendor for explanations, and finally settle for the app that presents what you require. How Much Does Pulse Cost? Contact Norkon Computing for their enterprise pricing information and other product details on Pulse. You can also schedule a tour to see if the software is a perfect fit for your business. We realize that when you make a decision to buy Content Management Software it’s important not only to see how experts evaluate it in their reviews, but also to find out if the real people and companies that buy it are actually satisfied with the product. That’s why we’ve created our behavior-based Customer Satisfaction Algorithm™ that gathers customer reviews, comments and Pulse reviews across a wide range of social media sites. The data is then presented in an easy to digest form showing how many people had positive and negative experience with Pulse. With that information at hand you should be equipped to make an informed buying decision that you won’t regret. What are Pulse pricing details? What integrations are available for Pulse? If you need more information about Pulse or you simply have a question let us know what you need and we’ll forward your request directly to the vendor.